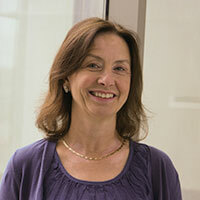 Rosemary Akhurst is a professor in the HDF Comprehensive Cancer Center at UCSF. She has over 25 years of experience working with mouse models of cancer, focusing on the TGFβ signaling pathway. Her research shows that TGFβ is a major player in tumor progression, cancer stem cell maintenance and a major regulator of tumor microenvironment, including angiogenesis and potent immune-suppression, all activities that drive tumor metastasis. She has a strong interest in cellular and molecular mechanisms driving abnormal angiogenesis in the human genetic disorder HHT, which is caused by functional loss of a single allele of one of the genes encoding TGFβ/BMP signaling molecules, endoglin, ACVRL1/Alk1 or Smad4. Her lab is currently investigating circulating stem cells and immune cells from HHT patients to provide deeper molecular insight into altered cellular properties and signaling pathways in human HHT.